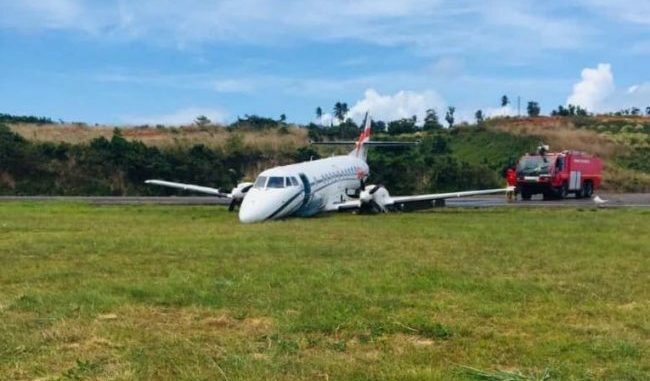 A BAe Jetstream 41, of Sky High Aviation Services, has suffered major damage after making a runway excursion after landing at Douglas-Charles Airport, in Dominica on Monday 8th April. According to local reports, there were no casualties among the passengers or crew on the turboprop aircraft and all evacuated the aircraft safely. The aircraft, registration HI-1038 was performing a scheduled flight from Santo Domingo-Las Américas José Francisco Peña Gómez Int'l Airport, in the Dominican Republic to Dominica Douglas-Charles Airport, Dominica and had just landed on runway 27 at Douglas-Charles Airport when it left the paved surface and headed into the grass. Photographs from the scene seem to show the landing gear and some debris on the runway, while the aircraft appears nose down on the grass.